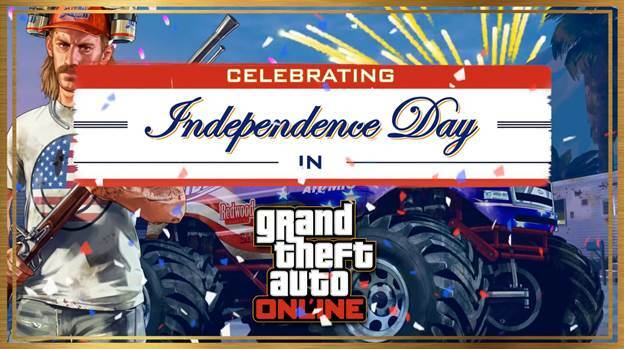 Tomorrow is July 4th, probably the biggest day on the US calendar (I won’t get political here), and Rockstar has decided that Grand Theft Auto Online should be joining in the celebrations. This means that a bunch of Independence Day-themed content is hitting GTA Online over the next two weeks, including Firework Launchers and weapon skins. For players that signed up to the Guest List last week, their exclusive rewards are already live: the Orange Wireframe Bodysuit and a cash bonus of GTA$300,000 (you’ll need to log in before July 9th to collect it). Anyone logging in between 10th-16th July will get an additional GTA$100,000 and a Pink Wireframe Bodysuit. Once more, Rockstar keeps providing reasons to keep playing GTA Online. Though admittedly, this particular reason is mostly aimed at our friends across the pond.